Price Drop! Was: $54.95 Now: $49.95. For a limited time only, while stocks last. Save up your computer desk space with our Dual Monitor Stand for 13-27 inch screen. Featuring two foldable cantilever arms, it can offer reliable support to your flat screens. After getting this flexible and high-quality monitor arm, you can view two screens at the same time with any distance and angle you want. Easy assembling is another shining feature of our dual monitor stand. Clipping the base to the desk board with screws would be finished. With the swiveling angle range from -90 to 90 degrees, you can adjust to your screens freely no matter where you stay in a room. What’s more, the height is allowed to be adjusted too. Proper height to view the screen would be better because you don’t need to crane your neck or strain your eyes to see it. 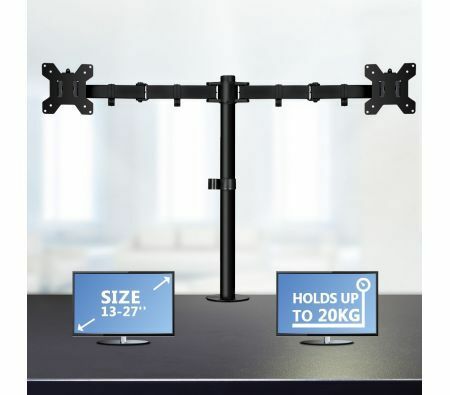 Whether you need to set up two computer screens on limited desk space, or want your TV screen to be tilted and rotated, our dual monitor stand for LCD/LED screens is your perfect option to enhance your viewing experience! 60.5cm x 14.5cm x 9.2cm approx.